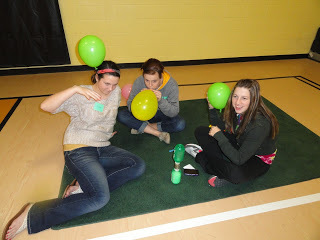 Having a Blast With Balloons! No matter what your age, balloons are fun. Balloons are fun to play with, look at and create with. but here are a few more things to do with balloons. Write a message on a piece of paper. Ideas: Hug someone you like, sing a song, pat your head, hop on one foot, etc. Fold this message and insert it into a balloon. Decorate your balloon with a marker before you blow it up. After a game of Balloon Toss (keeping the balloon in the air as long as possible before it touches the floor), pop your balloon and do whatever the message inside tells you to do. One or all of these should produce lots of laughter! Can you make a balloon stick to your hair or a wall? Can you get it to pick up thread or some other lightweight object? You can build a negative electrical charge by rubbing an inflated balloon on someone’s hair. Tiny particles (electrons) move from the hair to the balloon. The balloon will now stick to various things. How many things can you find that are uncharged that you can make it stick to? Who has not made funny noises with a deflating balloon’s “neck?” Inflate a balloon but do not tie it. Stretch its neck as the air escapes. You can make singing and silly noises. Twist and turn long skinny balloons to make animals and shapes. At our house, many boats and planes were created with the use of a balloon. Not all of the experiments worked, but it was fun and a good learning experience. Give your older kids some balloons, tape and spare “parts” from their exploration play and let them create. Being the photo journalist for these experiences and encourager will be some of your favorite memories. Blow up a balloon and draw a face on it. Do not tie the balloon closed. Deflate and keep in your pocket. Then, pull out your “balloon buddy” whenever you need an attention getter. This is especially fun and effective for transition between activities for younger children. Older children will enjoy making their own balloon cast of characters. Action examples: sit right down, come to me, pick up the toys, etc. You can make up any tune, words, and name for your balloon.